When Dave Frohnmayer died on March 10, he left a deep legacy as the University of Oregon’s longest-serving president. But his impact extends well beyond our campus. 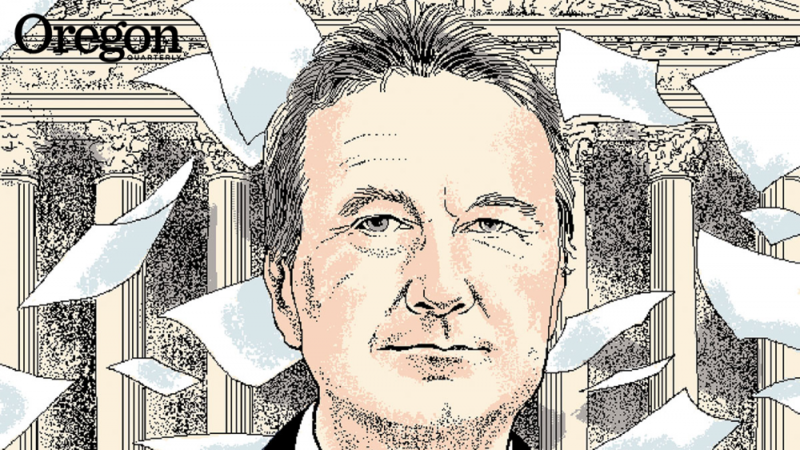 Here, John Frohnmayer reflects on his brother’s substantial influence in the nation’s highest court, making note of a dozen points that were key to his success. If the United States Supreme Court is the World Series of the legal world, then Dave Frohnmayer batted .850 against the best pitching imaginable. He won six out of seven cases that he argued in front of the high court. The takeaway is that Dave was very, very good at lawyering. Long before becoming dean of the UO law school and then president of the university, Dave served as Oregon’s attorney general, taking office on January 5, 1981. Over the next 11 years he built a reputation as the most successful Supreme Court advocate of any state, with a record of wins before that court that stands to this day. Dave was brilliant, and dedicated and ambitious and aggressive, but those qualities alone do not translate into success in the fickle and unpredictable world of the law, so I, as his brother and admirer, will try to explain how he did it. 1. He wanted to be a player. As a brand-new attorney general, Dave inherited a case involving prison overcrowding, in which the state had been ordered to release some 700 prisoners. Already on board at the attorney general’s office were two young but extremely able lawyers—Bill Gary and Jim Mountain—whose US Supreme Court experience was exactly zero. They cobbled together a request to Justice Rehnquist, arguing that an Ohio case with similar facts was on its way to the Supreme Court, and to their amazement, he granted a stay. They filed an amicus brief in the Ohio case and Dave, along with Gary, flew to Washington, D.C. for the argument. He could have said the case was not his baby, or he had to learn his new job, or dozens of other perfectly acceptable reasons, but he wanted in the game. 2. He wanted to make sure that all states were well represented at the Supreme Court, so he helped provide training for other states’ advocates. When Dave arrived in D.C. for the case, he was appalled at what he found. The lawyer arguing the case was over-matched and under-prepared. Coincidentally, the Washington Post printed an article saying that the states were doing a lousy job at the Supreme Court. Dave called up the writer of that article and worked with the National Association of Attorneys General (NAAG) to create a program that helps all states coordinate amicus (or “friend of the court”) briefs, holds practice oral arguments, and trains the states’ advocates to appear before the high court. 3. He convinced his staff that Oregon could be a national leader. Dave believed his state deserved the best—including the best legal representation possible. He believed that Oregon’s Department of Justice could influence legal policy and practice across the country. The vehicle he found to start building this esprit was a case entitled Oregon v. Kennedy. The defendant was a convicted thief who moved for a mistrial and argued double jeopardy on the grounds of prosecutor misconduct. (A witness said he didn’t do business with the defendant. The prosecutor asked: “Is that because he is a crook?” Oops. Mistrial.) So, does the accused get off scot-free when it was his own motion that aborted the trial? The Supreme Court said it would decide. 4. He sought the advice of others who had more expertise, or simply a different viewpoint, than he did. Dave had in mind a model that former Washington State Attorney General (subsequently US Senator) Slade Gorton had used to prepare for argument, and he had dinner with Gorton to pick his brain. The team to argue Kennedyconsisted of Dave, Bill Gary, John Bradley, and Steve Peifer, all of whom boarded a red-eye, arriving four days before the argument. (Jim Mountain was on the squad as well for all subsequent arguments). One hotel room was a dedicated “war room” with all of the books, binders, and papers of the precomputer days. The team worked 12- to 15-hour days, reviewing all of the cases that might be relevant, listing all of the questions that might be asked. They divided up the justices, reading their opinions and trying to parse what lines of argument might be most persuasive to each. The team brought in seasoned advocates, who had read the briefs and viewed the case with fresh eyes, to participate in moot courts. All of this was both helpful and exhausting, but the case had a major twist: Andy Fry, then solicitor general of the United States, had called and said the government was going to file an amicus brief and wanted half of the 30 minutes of argument time. Arguing for the government was a young lawyer named Samuel Alito, later a Supreme Court justice himself. 5. He walked the walk. As the attorney general, Dave personally argued the case. He was like a basketball player who wanted the ball for the last, crucial shot. He was never more in his element than when he was sparring and matching wits with some of the smartest people on the planet. In oral argument, justices fire questions, sometimes interrupting the advocate in the middle of the first sentence. Then, another justice may ask a question while you are trying to answer the first, so you have to keep multiple balls in the air long enough to get back to the first question and still not lose the three essential points you want to make before your time expires. Dave was a master at this. The tapes of these arguments are available, and confirm that he spoke in complete, compound sentences. He said the court should adopt a rule that is easy to administer, that will not make trial judges reluctant to grant, and that the words used should have clear predicates and establish clear standards. Justice Rehnquist, in the majority opinion favoring Oregon, said that the rules the Supreme Court had set down in the past “. . . had been stated with less than crystal clarity” and that henceforth, when a defendant sought mistrial and argued a bar to further prosecution, it had to be based on the intent of the prosecutor or judge to cause a mistrial (i.e., intentional misconduct). A win. 6. He knew more about his case and all of the precedent law than anyone else did. Dave’s second Supreme Court case was Oregon v. Bradshaw, where a body was found in a wrecked pickup and the question was, who was driving? The police arrested Edward Bradshaw and he asked for an attorney. The police, under the Miranda doctrine, were obligated to cease the interrogation. Bradshaw was then transferred from Garibaldi to Tillamook (a distance of 10 miles), and while in the back of the police car asked, “What happens to me now?” He subsequently was read the Miranda warning again, was given a polygraph, and confessed that he was the driver. He said he was drunk and had passed out at the wheel. He was convicted of manslaughter, driving while intoxicated, and driving without a license. Did he waive his Fifth Amendment right to counsel and to remain silent? The Oregon Appellate Court said no and reversed the conviction. Before the Supreme Court, Dave asked whether, under the prevailing case law, a suspect who had requested a lawyer could change his mind. Justice Marshall (a civil rights lawyer before ascending the bench) immediately pounced: “How do you conclude that he changed his mind?” Dave responded that footnote 9 of Edwards (the controlling case) allows for the defendant to reinitiate conversation and thereby waive his Fifth Amendment rights if he does so intelligently and knowingly. Marshall: “Suppose he says: ‘Now I lay me down to sleep?’” Dave: “That is not dialogue.” Dave then spoon-fed back the language and reasoning Marshall had used in another opinion. His knowledge was encyclopedic. 7. He spoke clearly, persuasively, and passionately. 8. He kept his cool, no matter what happened. The Supreme Court runs on a strict schedule and in the middle of an argument in Oregon Department of Fish and Wildlife v. Klamath Indian Tribe, the chief justice called for a lunch break. The Oregon team was escorted to the cafeteria by the marshals, and after lunch, Dave, who was wont to smoke smelly, cheap, disgusting cigars, asked to do so and was escorted to a portico where he laid his notebook on the railing as he groped for a match. Up came the wind off the Potomac and blew his notes over the rail, into the bushes, and onto the lawn. Without thinking, Jim Mountain vaulted over the rail, only to find the drop was about the height of a basketball hoop. The papers were recovered and the marshals greatly entertained. Dave returned to complete the argument completely unfazed. 9. He listened carefully to what the justices were asking. 10. When the facts were compelling, he approached his argument like he was presenting to a jury. Whitley v. Albers arose out of a riot at the Oregon State Penitentiary. A guard was taken hostage, and during his rescue, Gerald Albers, an inmate, was shot in the knee with a shotgun. He claimed he was subjected to cruel and unusual punishment in violation of the Eighth Amendment and sued for violation of his civil rights. Dave started with the details of the rescue and said the whole event took less time than it took him to describe it. He then opined that a jury should not be allowed to second-guess prison officials acting during a crisis. But then, he returned to the facts: a prisoner had a knife, said he had killed one inmate and would kill others, All of the inmates were out of their cells and refused to go back, the furniture had been trashed, and they had put up barricades. Maintaining order is the primary purpose of prisons, he argued, and the prison officials should be given broad discretion. He ended with a very jury-like plea: “The prison officials here should get a hero’s citation, not a civil rights lawsuit.” He was persuasive, but just barely: the decision was five to four in favor of Oregon. 11. He learned that no matter how prepared or how good you are, you may win (or lose) on a fluke. After consulting experts and analyzing evidence, Dave chose three paths to demonstrate a “compelling state interest” for its actions: First, that peyote adversely affected the health and safety of the people of Oregon in that it lasts for up to 12 hours and is unpredictable from user to user and from use to use. Second, Oregon must be religiously neutral (to not violate the establishment clause) and thus cannot favor one religion with specific exemptions. And finally, that Oregon should not be put in the position of having to parse what is and is not a part of any given religion. The result flabbergasted Dave. Justice Scalia, writing for the majority, “decided the case on the basis of an argument that was never briefed, never argued, never made, and frankly, never fully imagined by the parties,” Dave said. What Scalia wrote was that religious exemption issues are matters for the state legislatures and not for judicial balancing. He also held that an individual’s religion does not excuse him from compliance with an otherwise valid law that the government is free to regulate. Congress quickly passed the Religious Freedom Restoration Act and later the American Indian Religious Freedom Act Amendments, and the Oregon legislature created an affirmative defense for good faith religious use of peyote. 12. He made all those around him better. Bill Gary expressed his good fortune to have had the opportunity to work with Dave at the beginning of his career and again years later when Dave was of counsel to his firm. “He made you feel as if you were a partner and a colleague in producing a product of which everyone in Oregon could be proud,” he says. Bill and Jim Mountain would look at each other after hours of reading cases and playing roles in moot courts and wonder that they were getting paid to do this work—the most fun they had ever had in the practice of law. Perhaps that is the final key to success: in order to be good, it has to be fun. John Frohnmayer, JD ’72, served as chairman of the National Endowment for the Arts, the Oregon Arts Commission, and Oregon Humanities. His profile of Glenn Jackson appeared in the Summer 2014 issue of OQ.